I just wanted to make a few comments about my recent trip to Hollywood. 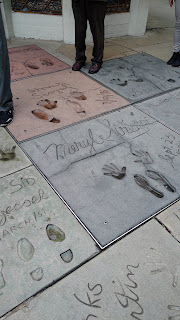 I saw Grauman’s Chinese Theater with the foot and hand prints of many performers on a previous visit a while back. But I was thrilled to see the comments and signatures of many current movie actors and actresses, including Meryl Streep. 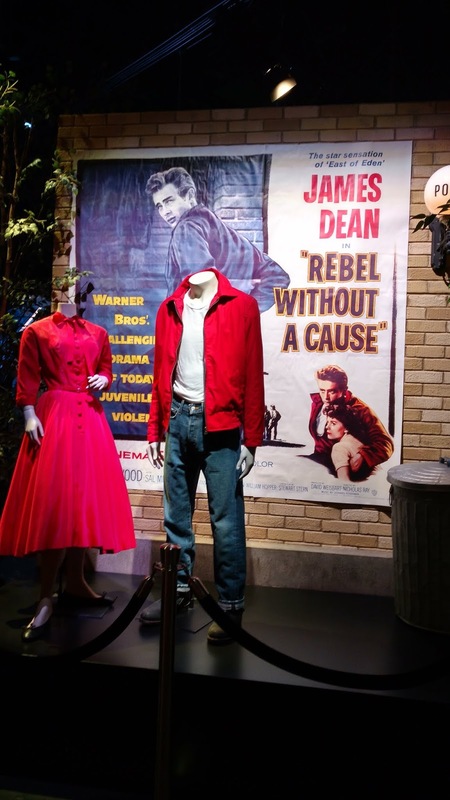 However, there is also the equally exotic Grauman’s Chinese Theater close by and actors and directors sometimes appear there to discuss their films which are shown at that spot. Sid Grauman was a master showman, and he sort of invented the “Red Carpet” show and all of the hoopla surrounding the premiers of films. He really turned Hollywood into the home of the stars. Jimmy Kimmel’s show is broadcast right across from the Dolby Theater where the Oscars are held, so that is why it is easy for him to have the winners on his show right after the annual ceremony. 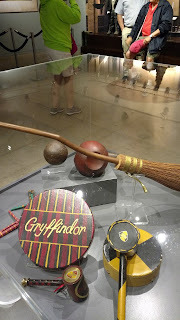 I also went on a tour of the Warner Brothers studio. 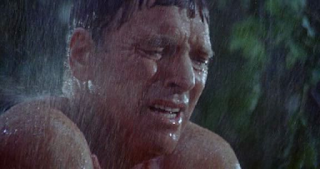 On one lot parts of movies such as East of Eden and The Music Man were filmed. The gazebo and town center for the TV show The Gilmore Girls is in this area, as well as the “Central Perk” coffee shop where Friends was shot. 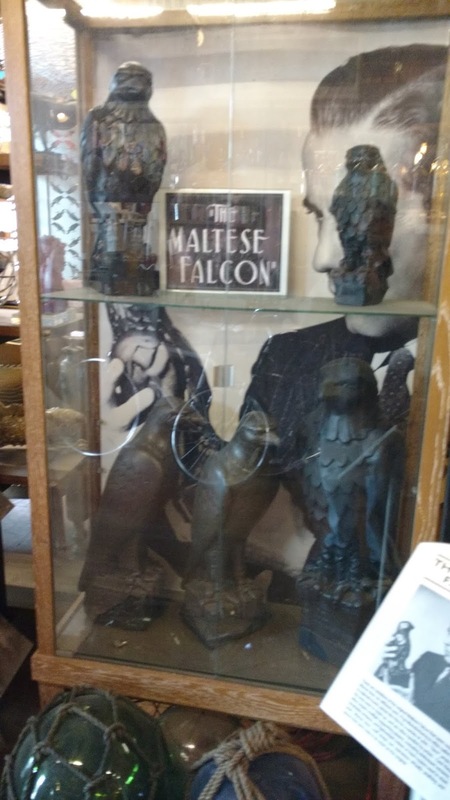 The prop building houses an enormous inventory of items used in movies, including antique lamps and a wall filled with telephones from various time periods. 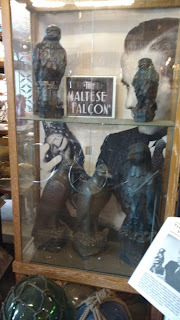 It was quite exciting to see the jacket that James Dean wore in Rebel Without a Cause, and the black bird statuettes used in The Maltese Falcon. 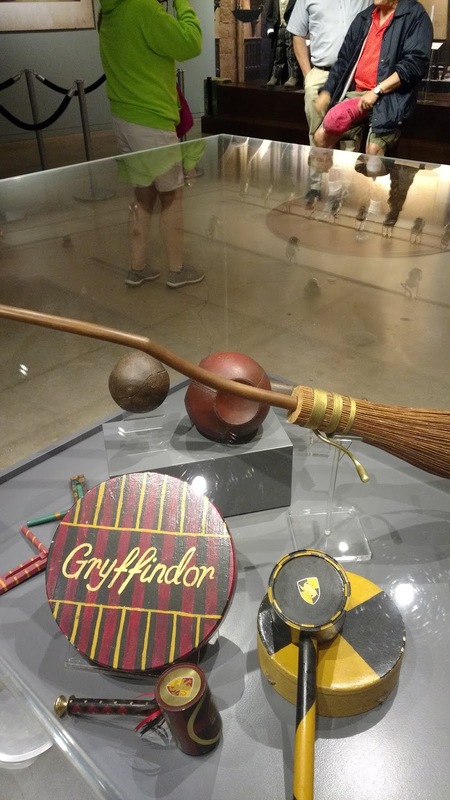 In the Harry Potter room, there are a number of items used in the films, including one of the flying broomsticks. 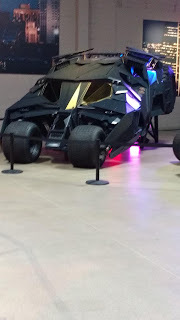 And, in one building there are a number of Batmobiles, including the million dollar one introduced in Batman Begins. Okay, now onto this week’s discussion. Every so often I like to add a post that springs from a discussion in my film class at the Bryn Mawr Film Institute. 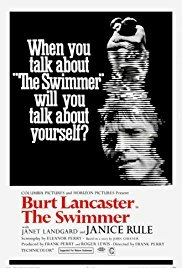 We recently viewed and commented on this not very well known 1968 movie. 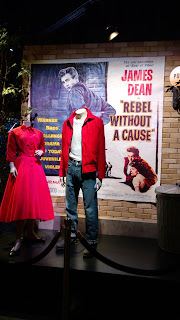 It is based on a John Cheever short story, and written for the screen and directed by the show business couple, who were married at the time, Eleanor and Frank Perry. They are the duo that gave us the psychological film, David and Lisa. The making of this movie encountered several problems. There was a dispute between Frank Perry and the producer, and Sydney Pollack came in (uncredited) to finish directing the film. Also, the studio pulled the plug on financing at the last moment, and star Burt Lancaster funded the last day of shooting himself. Despite those setbacks, the result is a thoughtful take on the hope of being part of the “American Dream,” and how, like in The Great Gatsby, that dream can turn into a nightmare. (I always felt that Lancaster would have made a terrific Gatsby, with that board, brilliant smile and twinkle in his eyes. 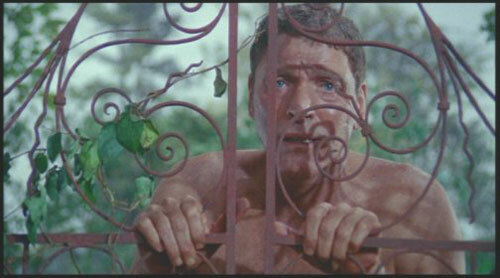 Of course his Elmer Gantry sort of fit the bill of a showy salesman whose false surface hides a darker side). 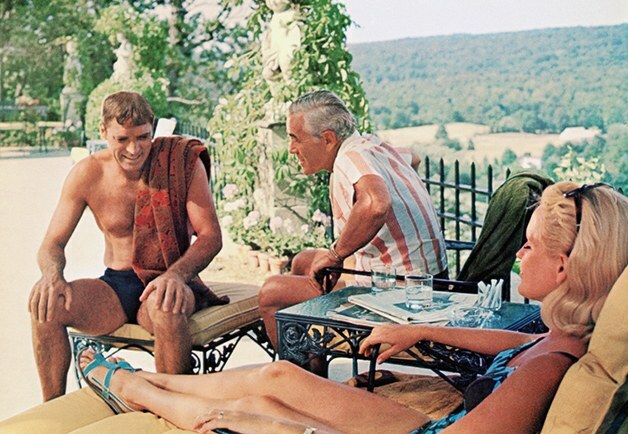 The story here starts out with beautiful morning weather as Ned Merrill (Lancaster), a man in his fifties who is physically fit, shows up in his swim trunks at the backyard pool of upper class suburban neighbors. These middle-aged people had enjoyed an affluent, alcohol-infused party the night before and are languishing in indolent hangovers (they look like they would have fit right in with the people at the party at the beginning of The Graduate). The conversation is pretty white-person bland as they greet Ned who they have not seen for a while. When asked, Ned says that his girls are at home playing tennis and his wife is doing fine, a response that fits in with what would be expected to be said in this environment. Of the houses he visits, this one is the farthest away from his own. The neighbors ask where has Ned been, and he says, “Oh, here and there, here and there.” The vagueness of his response may seem appropriate given the superficial conversation, but it is the beginning of what becomes the central question of the film: What has happened to Ned? His out-of-the-blue early morning desire for a swim in a neighbor’s pool may seem a bit odd, and it gets even stranger as the story unfolds. These well-to-do inhabitants don’t even swim in their pools for physical fitness. They indulge their bad habits while lounging next to their artificial waterways. 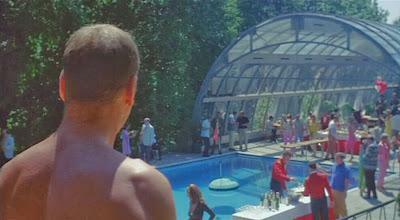 They just have parties to show the pools off, as status symbols. One man brags, “I didn’t skimp on anything.” He installed a water filter that, “filters out ninety-nine point ninety-nine point ninety-nine percent of all solid matter in the water.” His description sounds like a plug for a Nazi version of water filters whose goal is purity. One family takes care of their pool to the point that, as someone observes, “they nurse it like a baby.” The implication is that the love of material things has replaced affection for one’s own children. Another early indication of the flaws in Ned’s character occurs when he visits the next house. He’s all smiles but when he meets Mrs. Hamman (Cornelia Otis Skinner), she tells him he’s not welcome there. He says that he’s a friend of her son, but she says to him coldly, “A friend. How dare you use that word. You never came to see him. You never even called him at the hospital.” Ned asks, “Well how is he. Is he better?” Mrs. Hammar’s scowl shows that her son probably died. Ned is in denial about himself as a friend and the actual events that have transpired around him. Ned’s assessment of himself as being, “a very special human being. Noble. And splendid,” is beginning to seem like false pride. Ned is also in denial about his age. He is trying to be Peter Pan, staying forever young. In fact Shirley Abbott later says to him sarcastically, “Well how goes it in Never-Never Land?” The name of the place where Peter lives here sounds like a repeated denial of Ned’s facing his actual age and character. His desire to swim home, and his references to being on a quest seem like he’s playing a child’s game of make-believe. 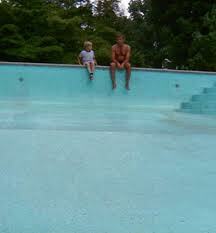 At another pool, there is a boy that has grown up, and Ned seems to not have seen him since the youth was much younger. So, we get the feeling of Ned being away from this world for a while. Where has he been? Has he been institutionalized? Or, has he just had some type of mental breakdown with amnesia concerning past times that were traumatic? 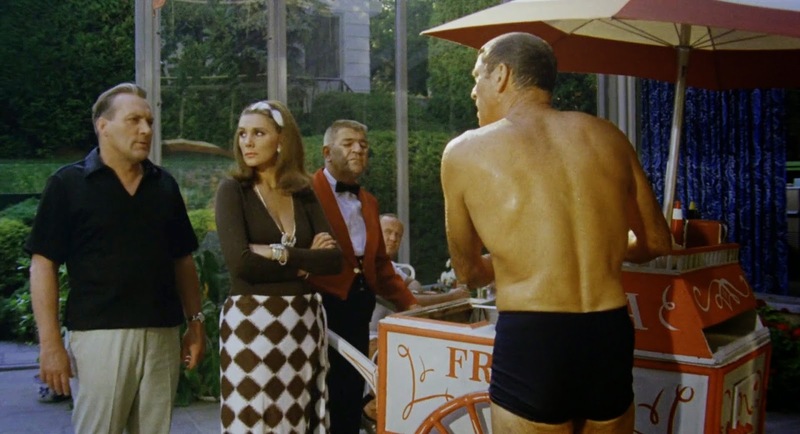 At the same pool, he encounters a young woman, Julie Hooper (Janet Landgard) who is twenty years old. She admits to having a crush on Ned when she was younger and doing babysitting. Her hero worshiping feeds Ned’s inflated idea of himself, and symbolizes his desire to recapture his youth. She finds his swimming quest romantic, and temporarily joins him on his journey. They jump over fences but at one point he lands hard and injures his leg, limping through the rest of the film as a symbolic indication that his delusion is failing. Julie’s virginal appearance is undercut for him when she talks about having met a boyfriend through a computer (must have been one of the earliest versions of internet dating), and admits to watching a naked man exposing himself. These revelations show the corruption of age and bang at the door of his self-imposed desire to keep out awareness of the loss of the innocence of a child. When he appears to try to kiss Julie (maybe to taste her vanishing youth? ), she is repulsed, because in her eyes he changes from a platonic hero to a dirty old man, and she runs away. At another home, the host tells Ned that he should leave his phone number because, “I’ve heard of an opening … smaller place than you’re used to … I think if you approach them right, take a cut just at first.” We now start to realize that Ned has fallen on hard economic times, and is unemployed. He, of course, doesn’t want to talk about this offer, since he would then have to face the negativity from which he is trying to escape. His poor economic standing is echoed when he visits the home of a couple of rich, elderly nudists, The Hallorans, (Nancy Cushman and House Jameson). Perhaps they represent a corrupted version of the initially innocent and naked Adam and Eve in The Garden of Eden, as they talk about how Ned still owes them money. The husband says maybe they could lend Ned some more funds, for old time sake, as a friend. But, his wife is all business. She says, “He’s not going to get a penny!” She continues by stating, “Friends are not deductible.” Their dismissal of Ned, who used to be one of them, is an indictment of the coldness of people who put their money first. They illustrate that failure in the world of capitalism draws scorn and dismissal. Of course Ned was part of this monetarily successful world that marginalized others, and he still believes that he is part of it. When he approached one estate driveway he encounters a black chauffeur who he mistakes for the previous African American employee. The driver gives him an annoyed look, but Ned remains clueless as to his own prejudicial comment. It is a subtle reference to the racist claim that all blacks look alike. There are no African Americans living in this affluent area, except those who are servants or employed in menial jobs. Ned visits the home of a youth, Kevin (Michael Kearney). The pool there is dry. Perhaps it symbolizes the emotional barrenness of the capitalist world. Kevin thinks he’s a failure because he is a bad swimmer and would never become captain of any sports team. Ned offers some advice when he tells the boy that once he realizes it’s not “the end of the world because you’re not on the team,” he can appreciate “that you’re free. You’re your own man. You don’t have to worry about being captain and all that status stuff,” and he can be “captain of your soul.” Perhaps Ned’s comments show some insight into the futility of the competitive rat race he was part of, or it can also be seen as a rationalization on his part to deal with his failure to remain a star player in the business world. Ned’s delusional facade continues to crumble when he reaches the home of Henry Biswanger (Dolph Sweet), where another swank party is taking place. Ned earlier said of his daughters, “those kids of mine think I have all the answers. Those kids of mine think I’m just about it.” Here, we hear a different version of Ned’s life. A guest, Howie Hunsacker (Bill Fiore) - the name sounds like a barbarian who will rob you - says his boy had “straight A’s” and won a scholarship. Hunsacker’s wife, Lillian (Jan Miner) says, “we bring up our kids to behave themselves. 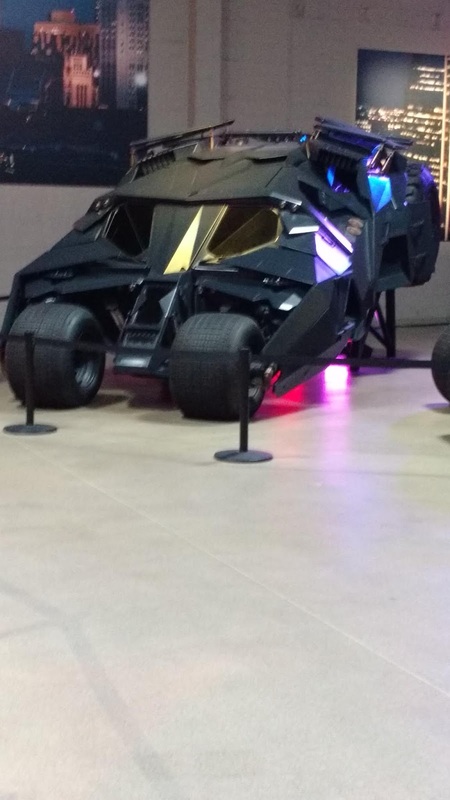 We don’t let our kids run around drunk, wrecking cars.” Another guest says that Ned kept the names of his daughters out of the newspaper after the drunken driving incident. Lillian says of Ned’s daughters, “those girls never paid no attention to him.” Howie says to Ned, “Your girls laughed at you. I heard them. They thought you were a great big joke.” Ned then sees a hot dog cart that he says belongs to him. Biswanger now owns it. We realize that Ned’s financial collapse probably led to a garage sale, where Biswanger bought the novelty cart. Ned visits the last house owned by Shirley Abbott who used to be his mistress. His delusion tries to substitute the negativity of how he hurt her with a romanticized version of their relationship, reminiscing about places they didn’t actually visit together. 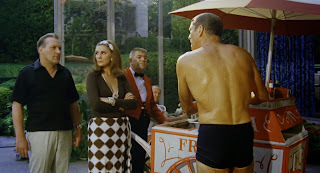 We can see her pain as he tries to seduce her again, and she almost submits, in the pool, but her anger sends him away. She destroys his version of their relationship when she says, “I lied! I lied all the time about loving it anywhere with you. You bored me to tears! With all your stories about your old deals and your old girls and your golf scores and your bloody war and bloody duty to your wife and kids. You bored me to tears! I was playing a scene with you. … I was acting.” It’s possible that the water in this story can be seen as an attempt by Ned to wash away ugly memories in order to return to what he considered a more pleasant past. However, it turns out to be a failed effort at being reborn into a hopeful time. Ned now moves down the ladder of success as he visits a crowded public pool. He is humiliated because he must beg for some money to pay for an opportunity to swim in the crowded facility where those with less money use a pool to actually cool off instead of having one as an indication of financial accomplishment. By the time Ned reaches his home, the beautiful weather is left behind, as Ned loses his sunny version of his life. We now have a raging rainstorm with its fierce downpour contrasting with the calm waters in the pools. This water washes away Ned’s make-believe world. The grounds of his estate are in decay and the house is abandoned, his family long gone as they probably abandoned him. 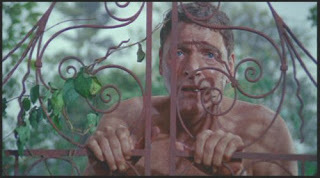 One member of the film class offered that, in keeping with the mythological analogies in the movie, Ned’s reference to the pools acting like a “river,” could be interpreted as Ned traveling along the river Styx on his way to hell, washing his feet at the public pool in preparation for his crossing over. The gates to his decrepit, run down home may signify the entrance to the underworld. He becomes sicker and shivers, as he finally reaches the door to his house, possibly expiring there. Ned is severely punished for not remaining a success in a capitalist society. 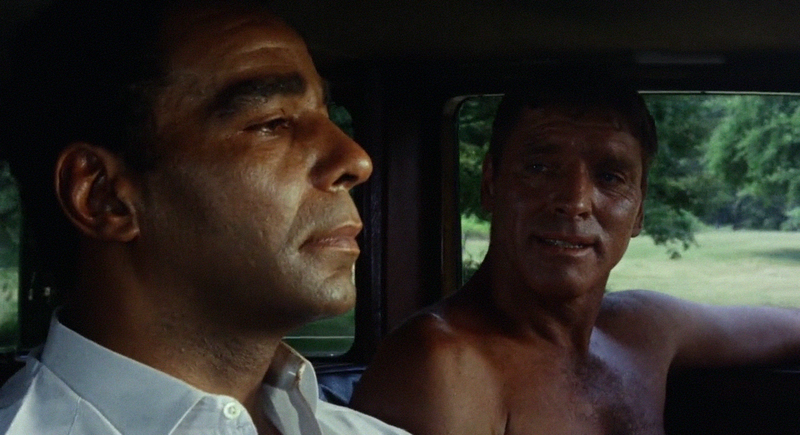 Burt Lancaster accurately described this movie as Death of a Salesman in swim trunks. The next film is The Miracle Worker.